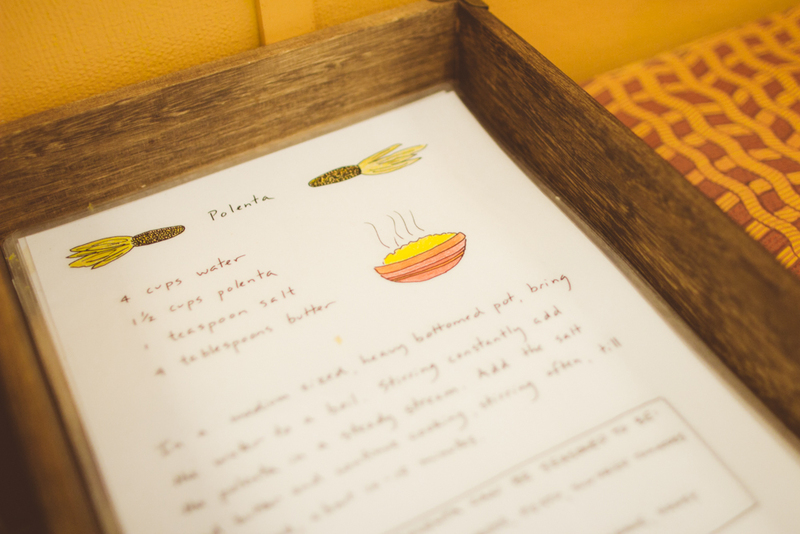 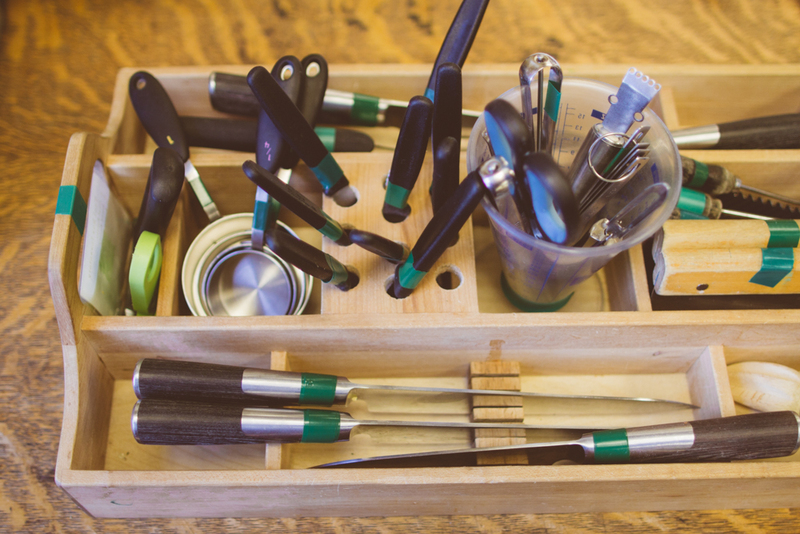 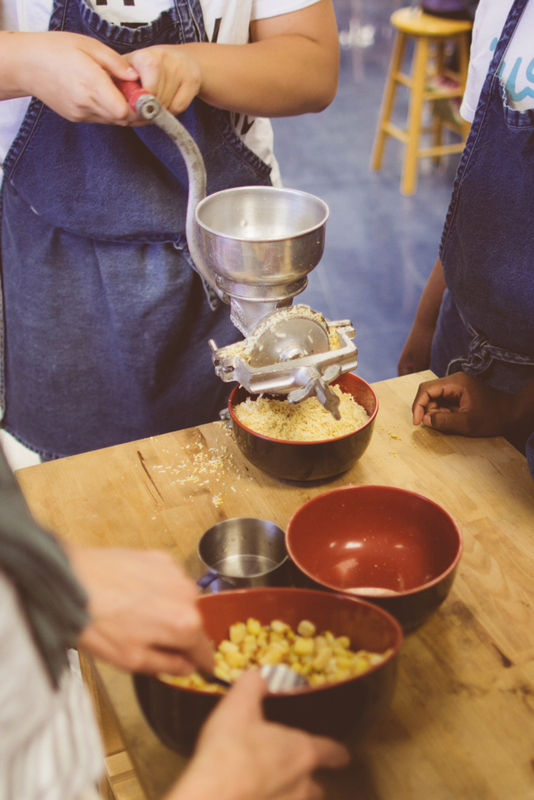 I recently sat amongst some of the luckiest students in the world in a kitchen class at the Edible Schoolyard Berkeley. 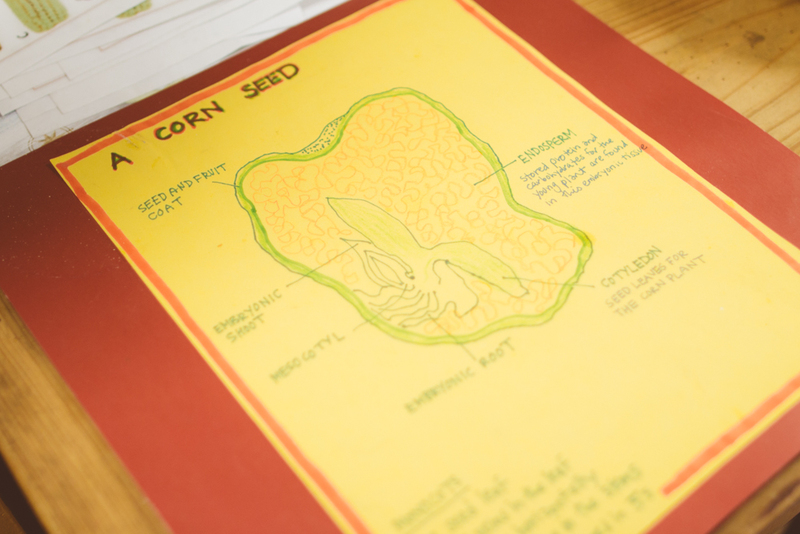 to the parts of a seed. 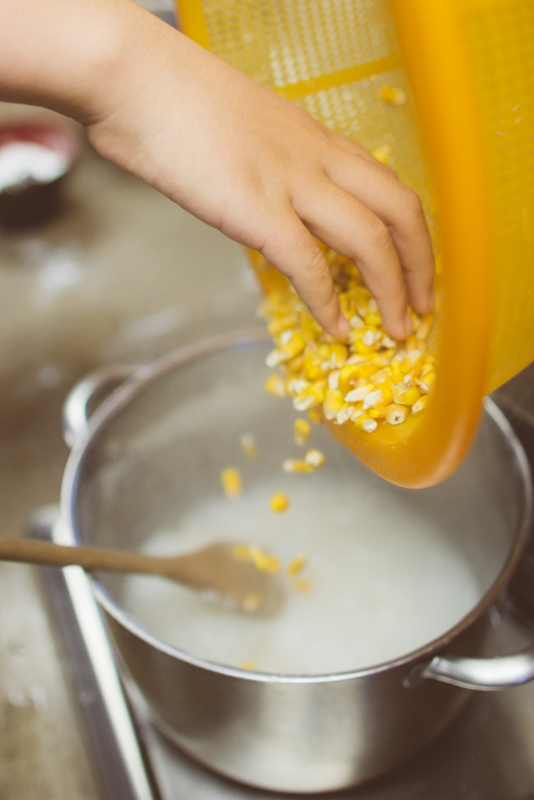 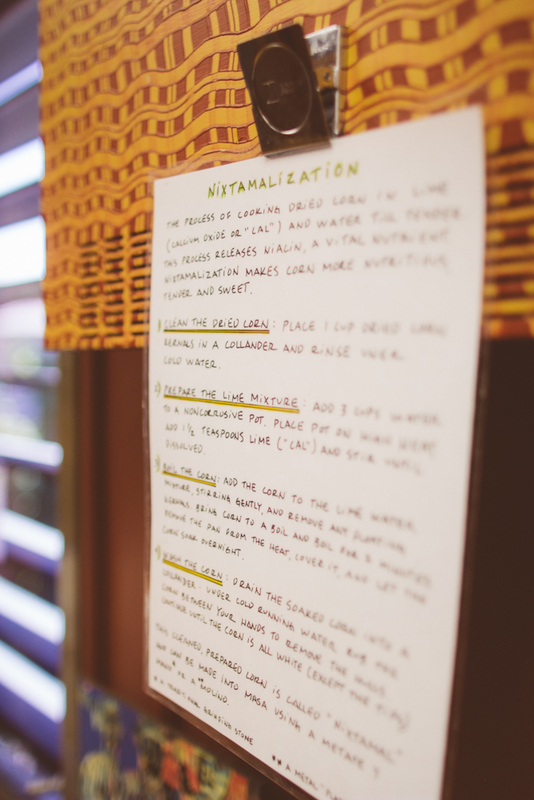 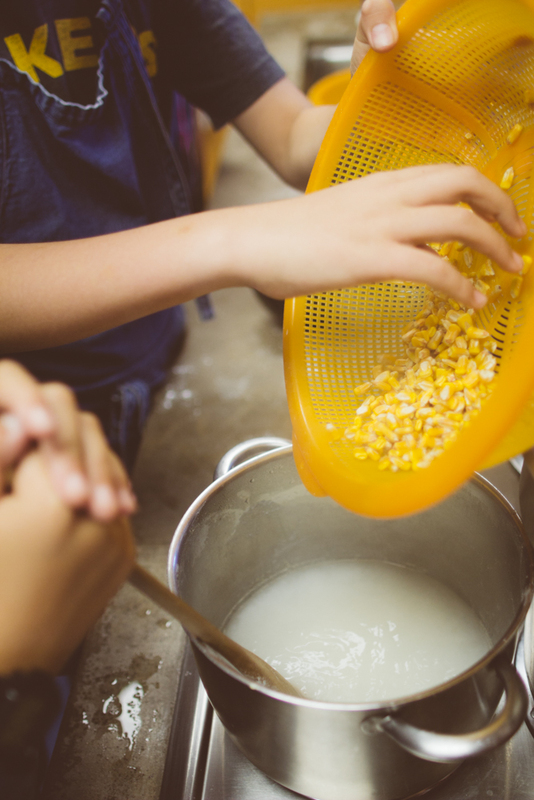 There were also stacks of recipes lying on the bookshelves that undoubtedly connected corn to many of the student’s home cultures. 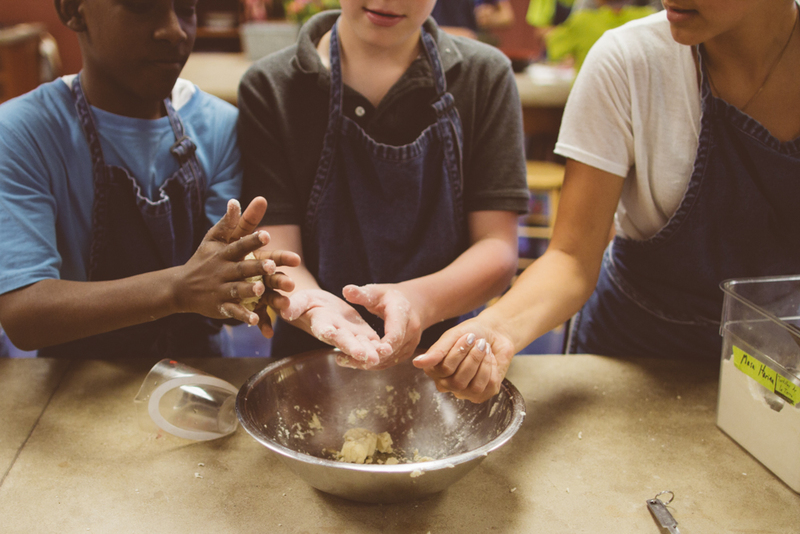 As students entered the classroom, the washed their hands, put on an apron, and had a seat at the central table to listen to instructions. 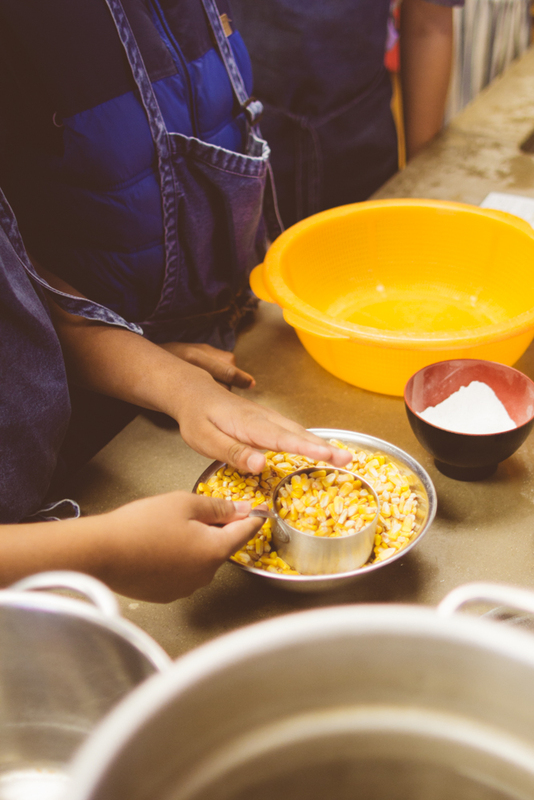 They were told that throughout that class period, they would be processing corn from it’s dried state all the way to cooking their own corn tortilla (that, of course, they’d get to taste at the end). 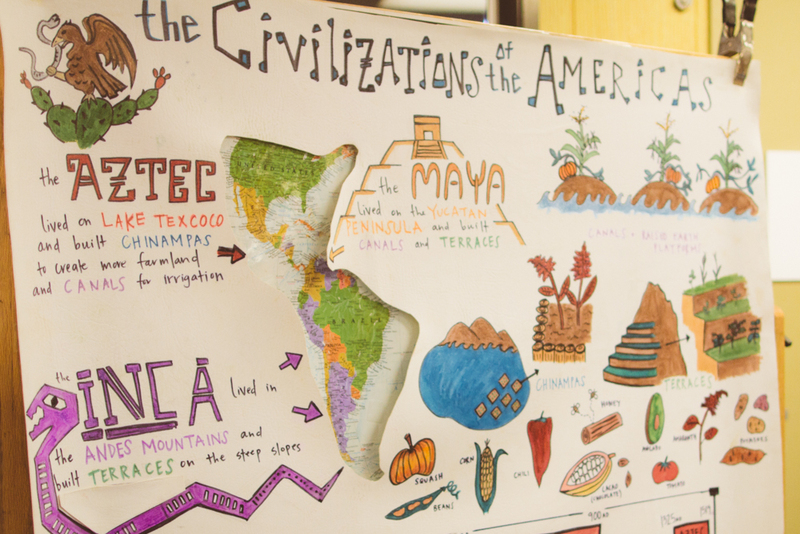 Students were then divided into their three groups to get started. 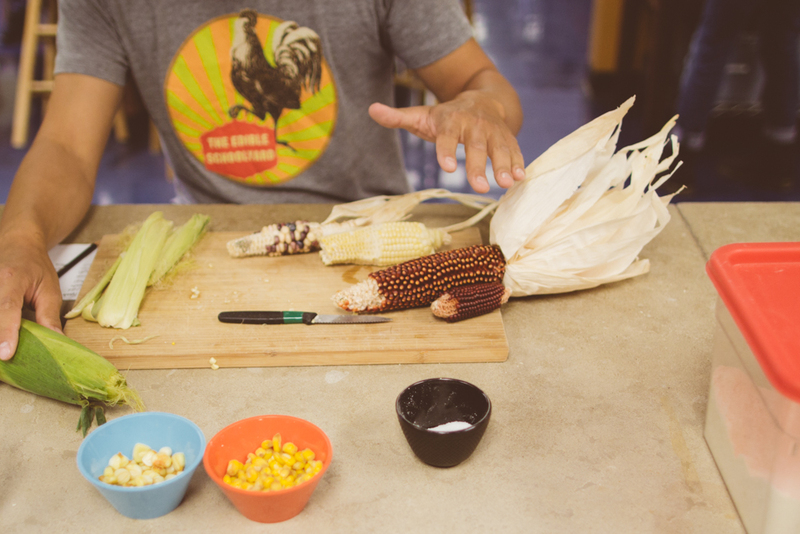 When students arrived at Mr. Nick’s table, they were introduced to the types of corn. 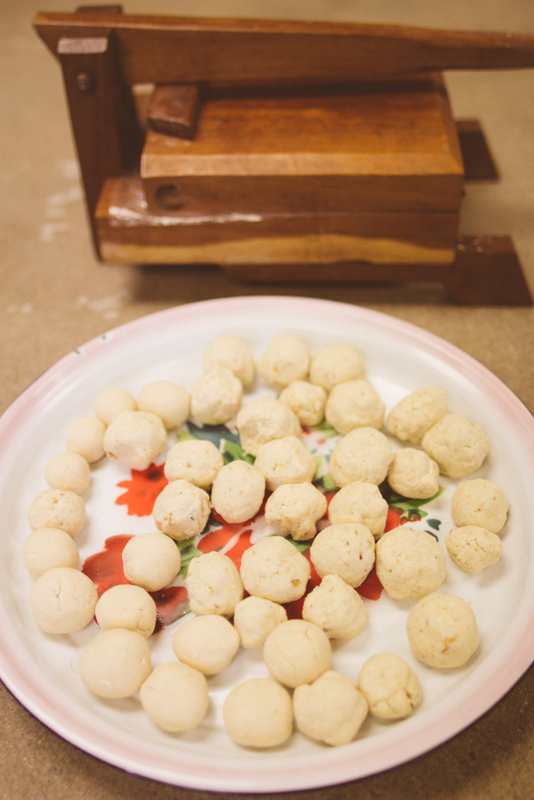 They were invited to touch and taste the different kinds. 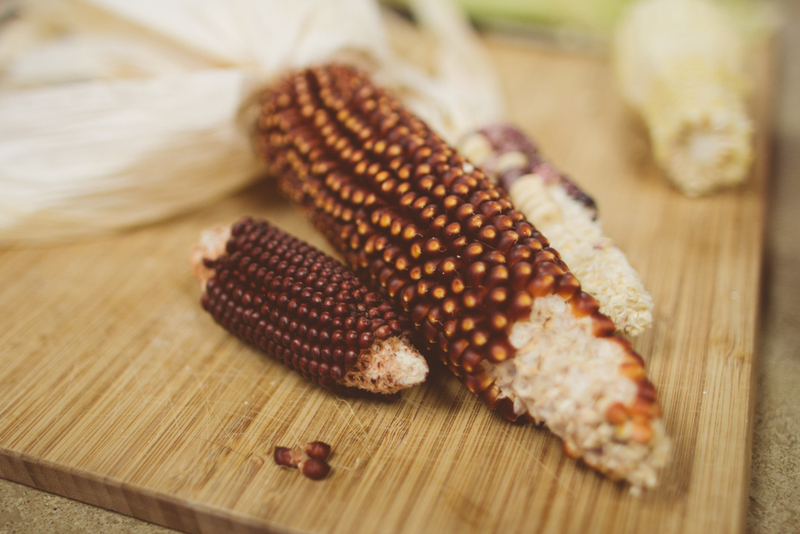 Dent Corn – eaten as a grain, rather than a vegetable; higher in starch and lower in sugar than sweet corn; has a dent (or dimple) that forms in the top of each kernel as it begins to dry out; also known as field corn; used for animal feed, making corn syrup, fuel, or biodegradable plastics. 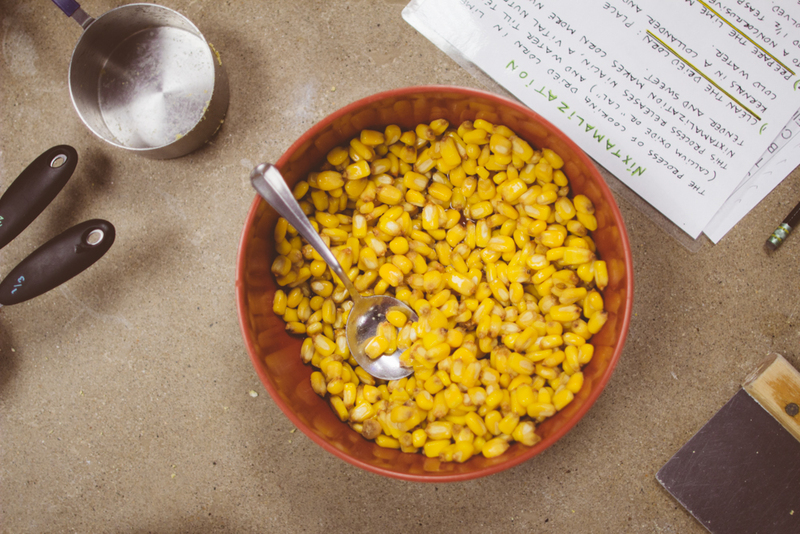 First, students measured and rinsed the dried corn. 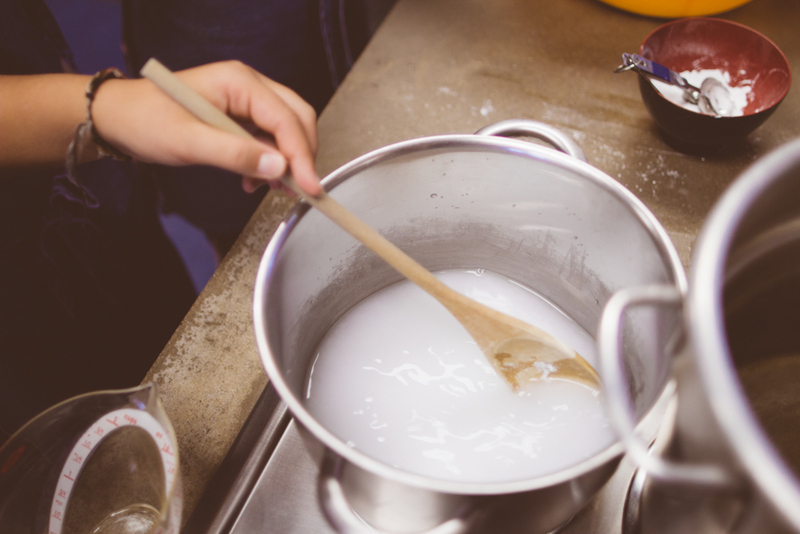 Then, they created the lime mixture by dissolving the lime in hot water. 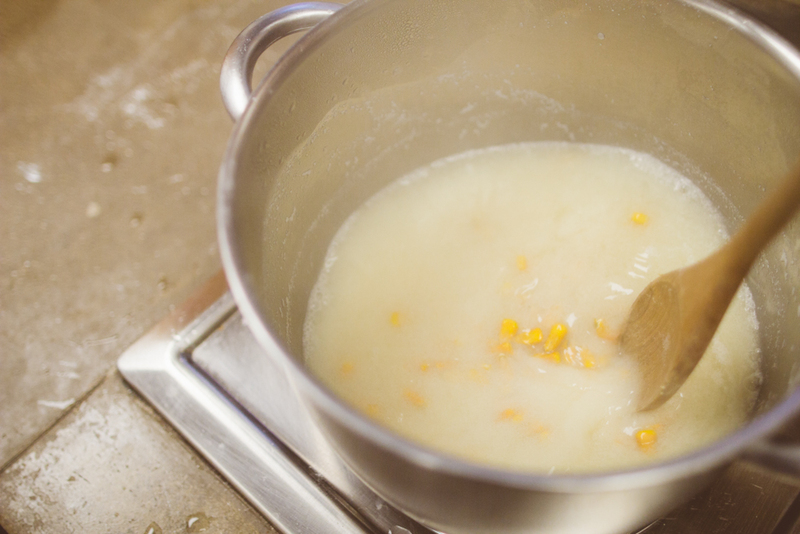 Then stirred gently. 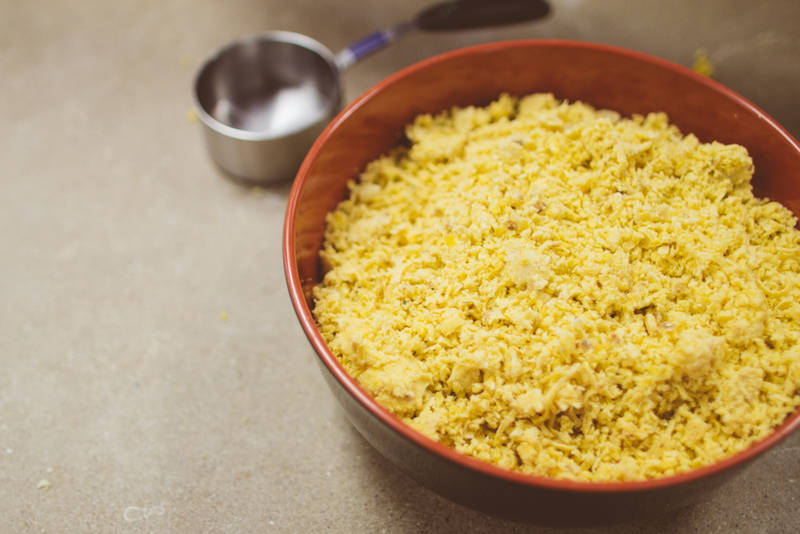 It would need to be covered and sit overnight to finish the process. 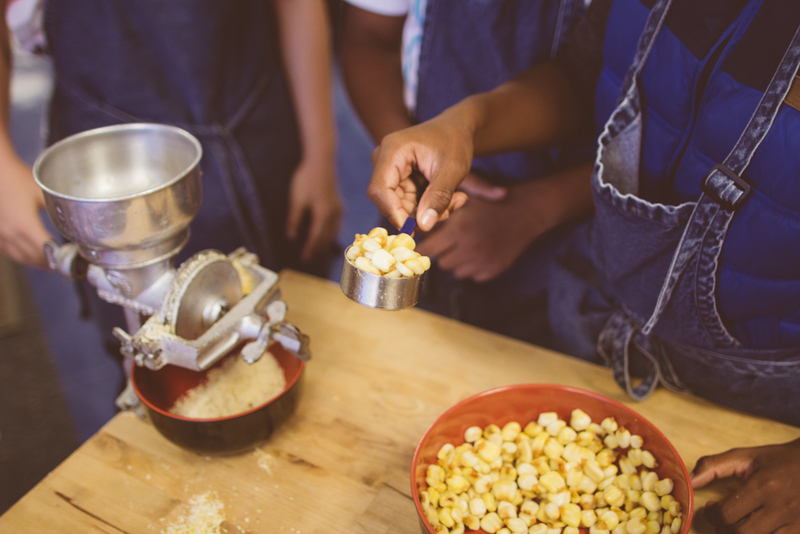 But with a little cooking classroom magic, some completed “nixtamal” magically appeared so the students wouldn’t have to wait until the next day to continue to the next step in creating their corn tortillas. 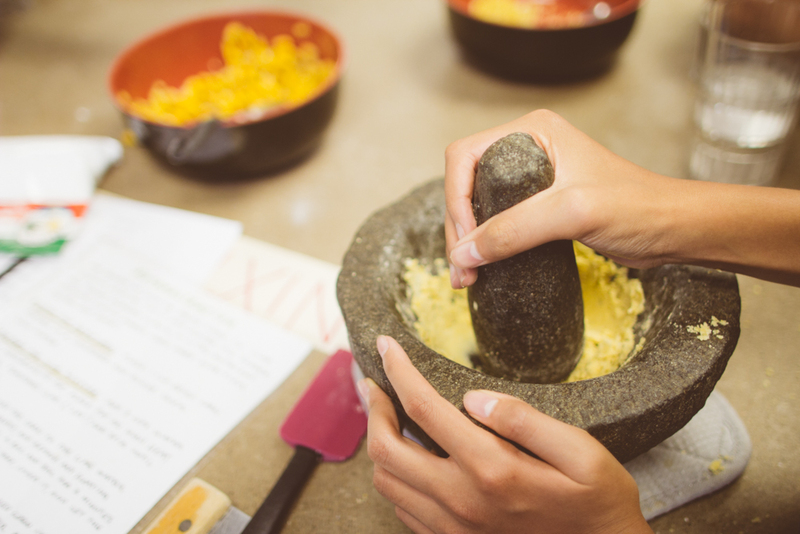 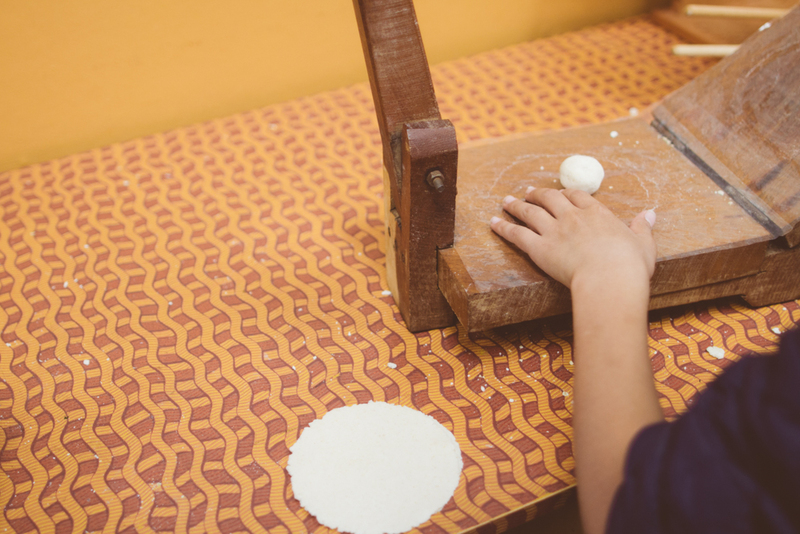 Their next step was exploring methods for grinding the nixtamal to turn into their dough for the tortillas. 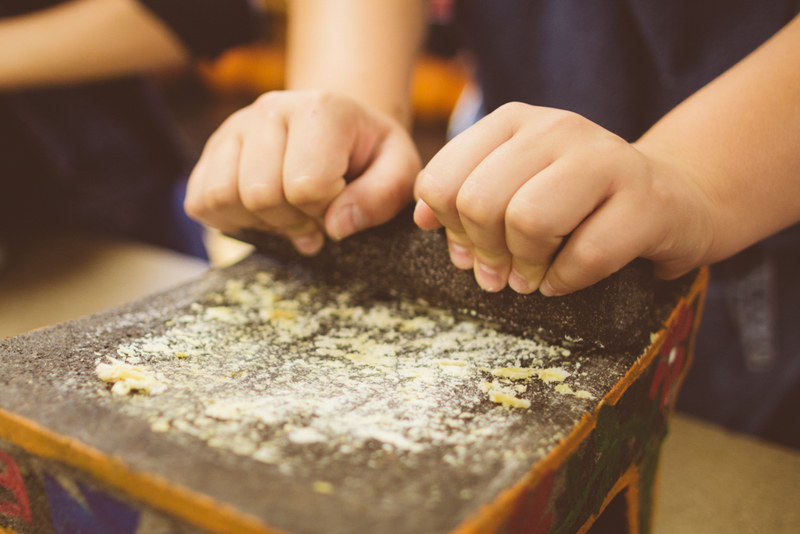 Also, this ancient sliding grinder. 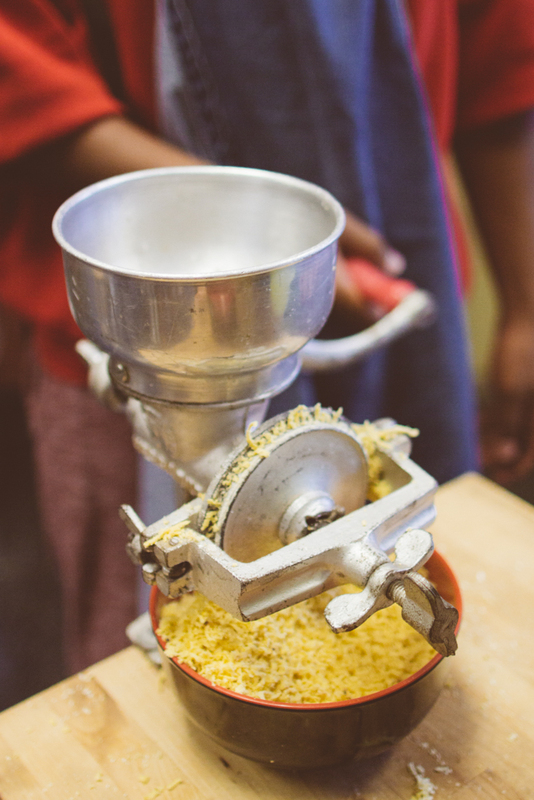 A favorite amongst the students was the hand crank mill which quickly and efficiently ground the corn. 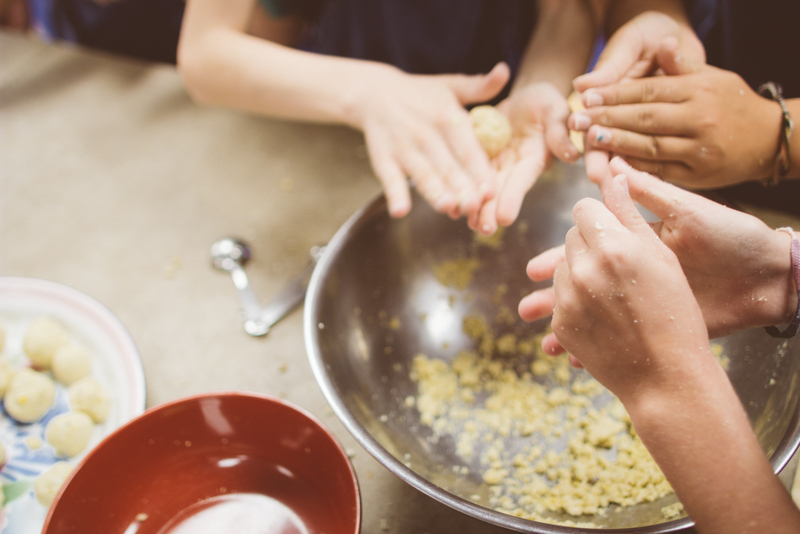 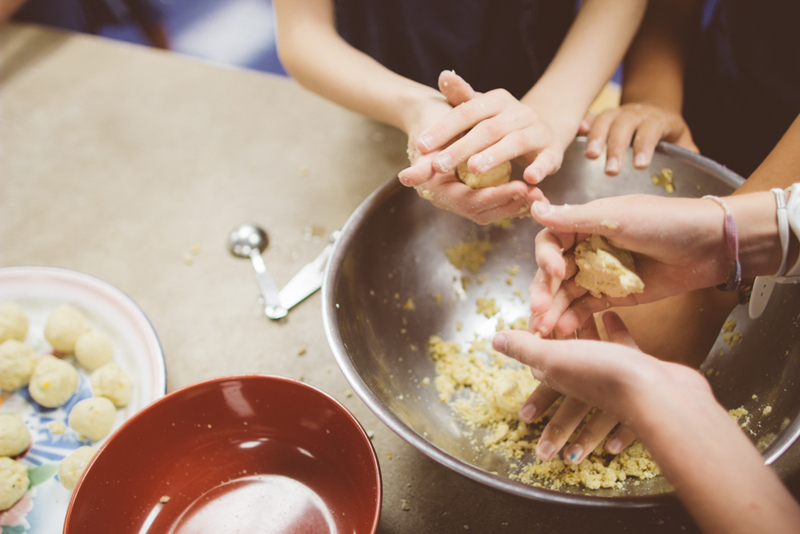 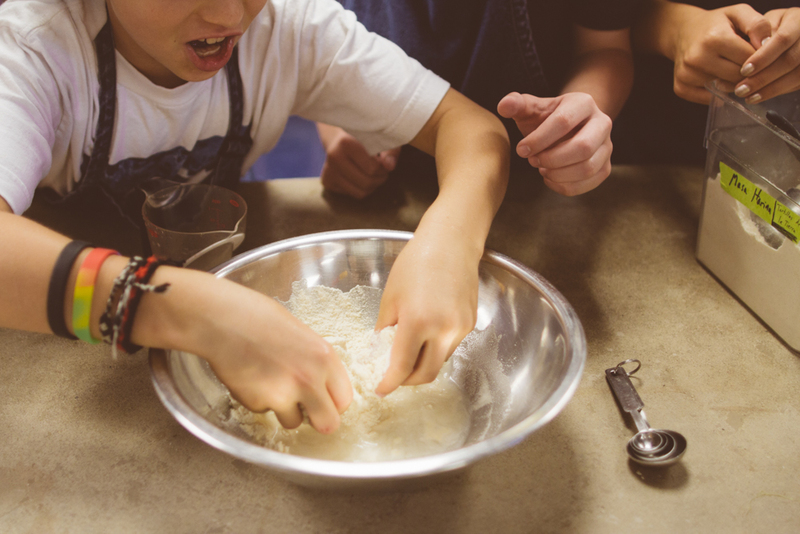 Students then took their ground corn flour (or masa harina) to Mr. Nick’s table where they would add warm water and a pinch of salt to turn it into a dough for their tortillas. 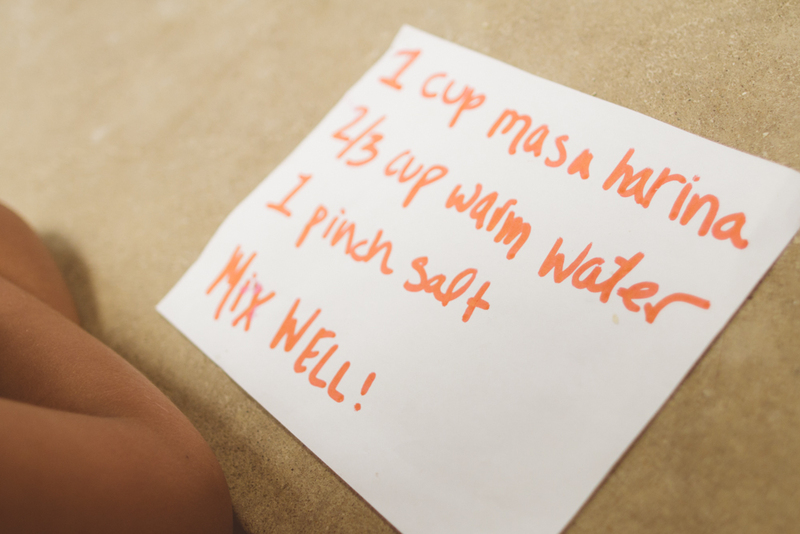 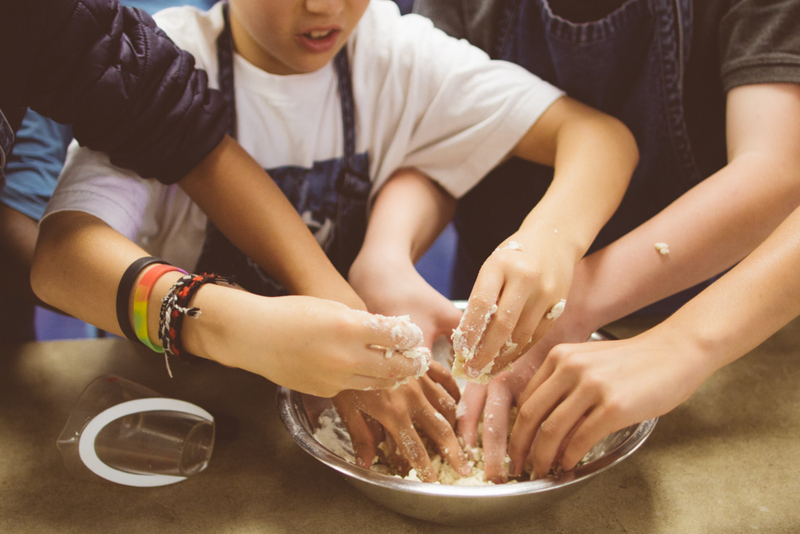 At Mr. Nick’s advice, the students decided their fingers were the best mixing tools! 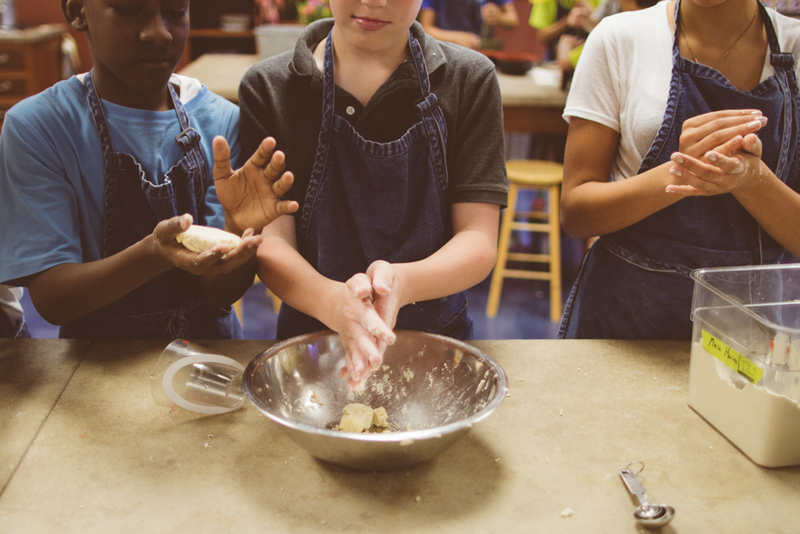 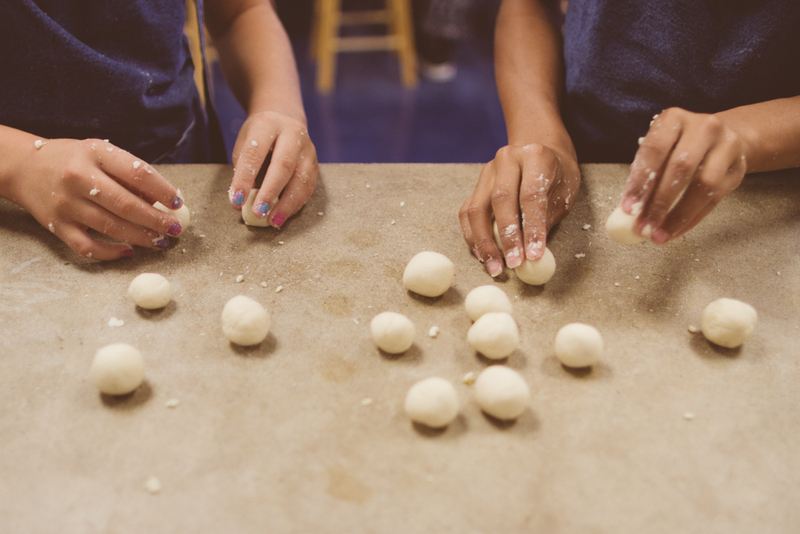 The students then rolled their dough into balls. 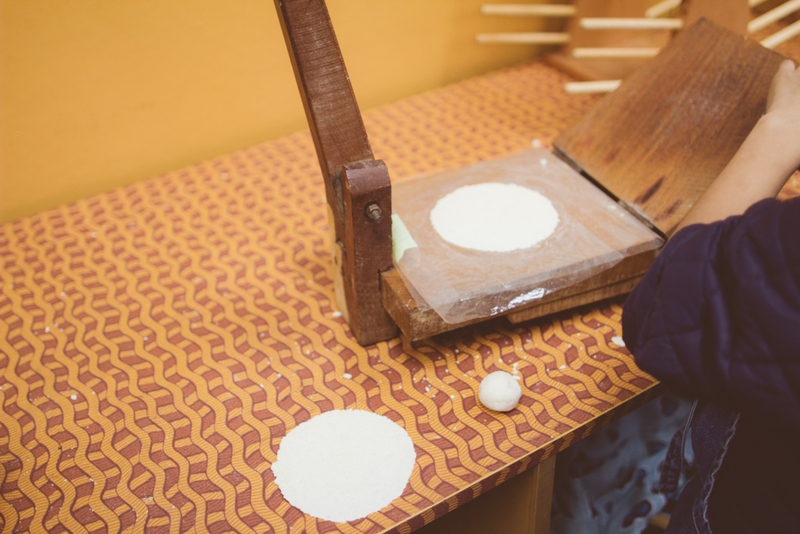 When they were finished, students took their dough balls to Ms. Molly’s table where they would use another hand tool: the tortilla press. 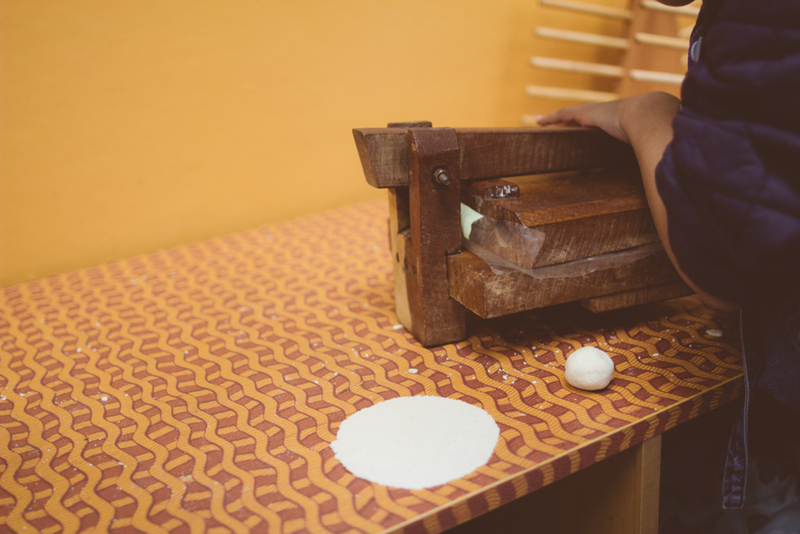 Students opened the press, placed the dough in the middle, and pressed down to make a perfect thin tortilla. 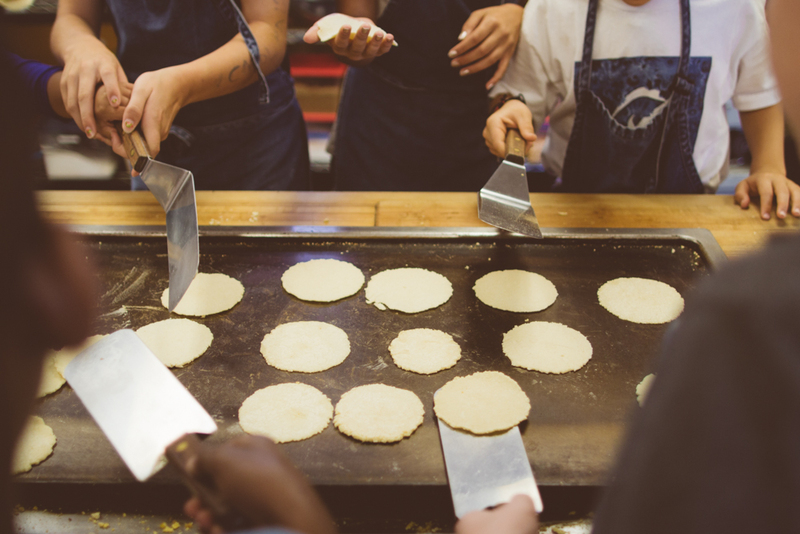 Students then took their tortillas to the griddle for them to cook. 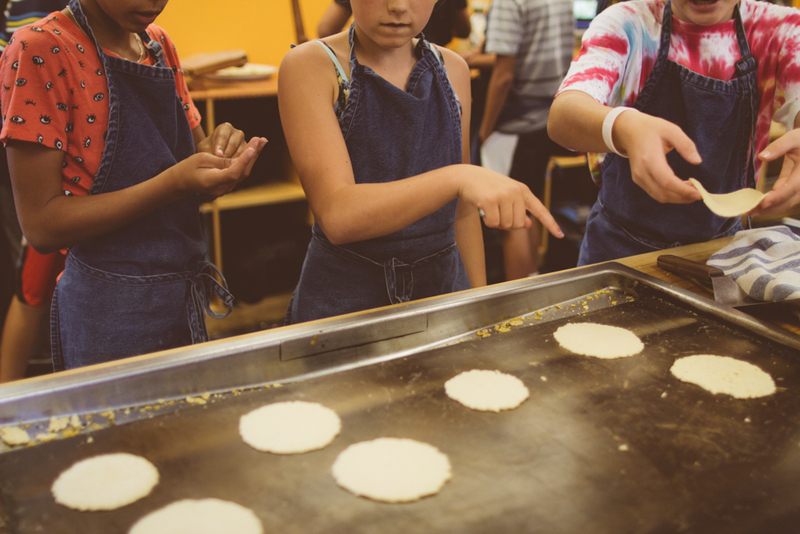 They watched carefully for the edges to curl up – that meant they were ready to flip! 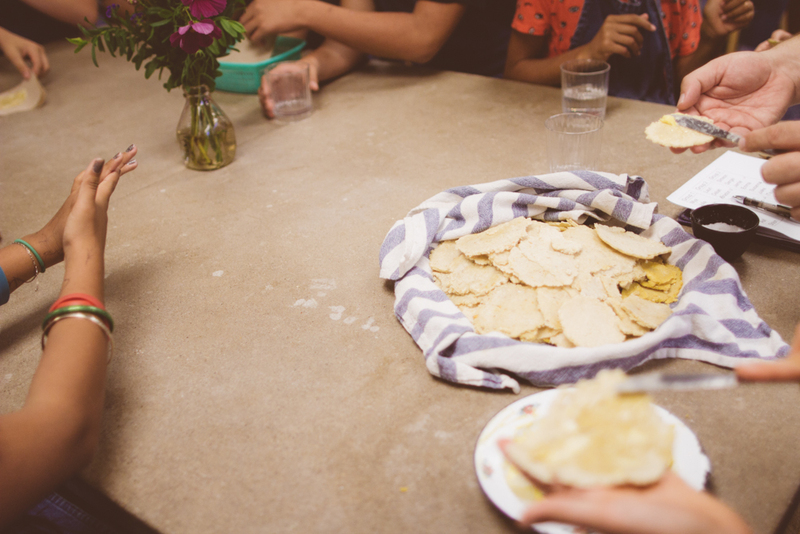 The conclusion of the lesson from corn to tortilla include tasting the tortillas the students had made with a little bit of butter and salt. 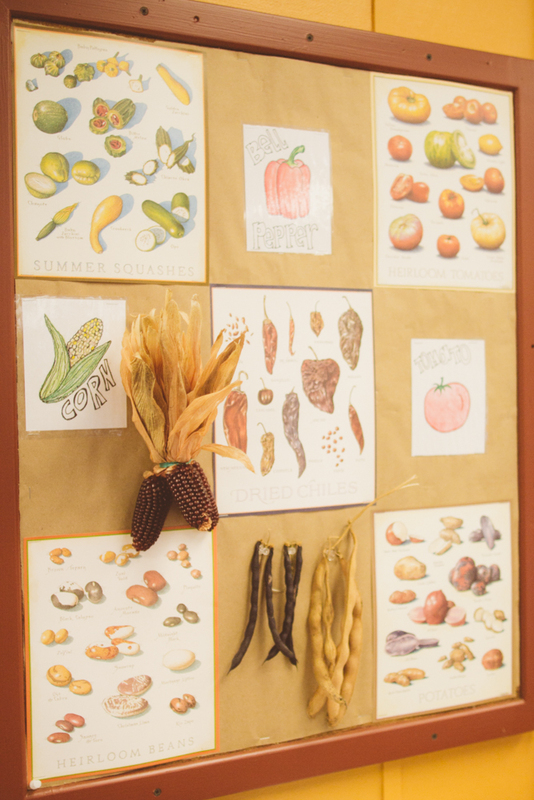 This lesson was a perfect example of demonstrating how familiar foods are processed from being grown on the farm to being presented at the table (with a strong historical context as well).